Cae Canol Centre is a Christian charity providing self catering accommodation for group residential activities at its centre in the heart of Snowdonia. Cae Canol is a converted farmhouse that can accommodate groups of up to 25 (or 30 between March and October) and there is an additonal log cabin available between March and October that can accommodate up to 7 people. 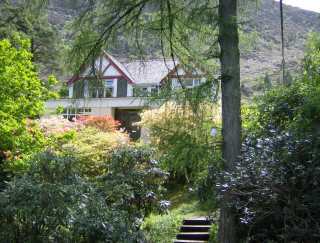 Cae Canol is set in 8 acres of wooded hillside with views towards Yr Aran and Y Lliwedd, the minor peaks of Snowdon. Cae Canol is an ideal venue for Church Youth Groups, Christian unions, Alpha Courses, Home Groups, training courses, etc. to hold their weekends away or longer. For the the adventurous it is an excellent base for hill and mountain walking, climbing, mountain biking or canoeing using local centres and instructors. For all there is space to draw closer to God free from the pressures and distractions of home. Cae Canol Centre is a Registered Charity No. 1113062. Cae Canol Centre is a company limited by guarantee, registered in England and Wales, No 05648674. Cae Canol Centre is a member of the Evangelical Alliance.